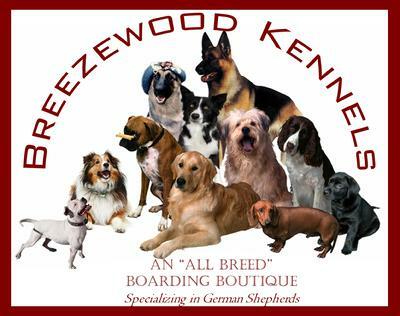 Although known for producing Top Quality German Shepherds, Breezewood Kennels has now expanded to include a distinctive "All Breed" overnight boarding facility. Nestled in an inviting private country setting, in western Loudoun County, Breezewood Kennels is offering to all its guests an "all inclusive" dog boarding experience at one reasonable fee. What does "all inclusive" mean? Not only will your dog be allowed to go outside several times a day to eliminate, but they will have playtime, exercise, fresh air & just plain fun at no extra charge! Our "all inclusive" daily boarding rate is $39.00 per night. Puppies - We do take puppies that are 4 months and older that have their current rabies. As you are now aware, puppies take a significant amount of attention to care for them properly. We spend extra time with these little ones to ensure the ongoing potty training is addressed and extra playtime is given. For this service we do charge an extra $10 per day for puppies that are under one year of age. 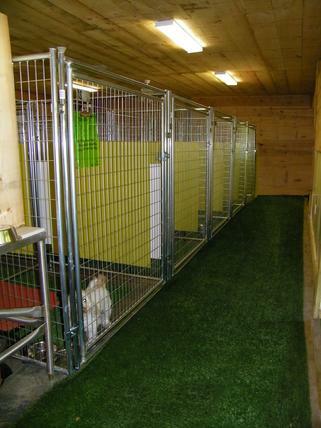 Our facility hosts both roomy "climate controlled" indoor kennels & outside play yards for (multiple) daily outdoor play times (weather permitting), socialization and elimination. 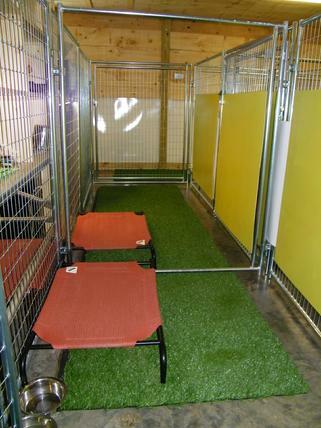 Our outdoor play yards are safe for all dogs. Each dog is evaluated individually and based on their size, temperament and play style are placed in the yards appropriately. Should your dog not be a social butterfly, you can also request individual playtime with our caring staff in lieu of group playtime at no additional cost. For added fun (in the summer) our play yards host a variety of puppy pools and fun water games! If you have multiple dogs in your household, you may request to have them boarded together at a discount rate for two or three dogs sharing the same run. Wish to bring comforts from home? You may bring a bed from home for your dog and/or any toys. We just ask that you do not bring their "favorite" irreplaceable one as it could get lost or damaged. Do I need to bring food? Yes as food is not included in the nightly rate. It is highly recommended that you bring enough food (same food as his/her current diet regiment to avoid tummy upset) for their entire stay, plus two days in case of emergency. Food must be brought in a sealed tight HARD plastic (rubbermaid/tupperware) container labeled with your dog's first & last name. We do have freezer & refrigeration space to accommodate all types of foods & treats. Should you forget your food or hard plastic container, additional fees for either will be charged at check in. Medications? There is NO CHARGE for administering daily oral medications or vitamins. If your dog is taking more than one medication/vitamin we ask that you bring those medications in a daily or AM/PM plastic pill dispenser tagged with your dog's name on the dispenser. This is to ensure proper dosage & times, etc. Should you forget this dispenser, you will be asked to fill a loaner dispenser before departure. What time is check-in? Check-out? Like most four-five star hotels, you check-out in the morning and check-in late afternoon. This enables our staff enough time to clean & sanitize the runs, bedding & flooring mats (both are also dried), all in time for our new guests to arrive that evening to the same high quality standards that you will come to expect. "Check-in (5-6 PM) & Check out (8-8:45 AM)"
Need to change it up to fit your schedule? No problem! 1:00-2:00 pm. - Mid-day check in or check out. When making a reservation online (in notes) just ask for either a mid day check-in/out (1-2 pm) "late afternoon check-out" (5-6) which includes an additional night stay should your return travel plans go awry and you miss the late afternoon pickup window! Vaccines Required - We are advocates of not over vaccinating our dogs but do require proof of a current rabies and a bordetella (kennel cough) booster given EVERY 6 MONTHS. Why every 6 months when your certificate states it is good for a year? Bordetella is spread rapidly through canine-to-canine contact whether your dog is at a kennel, the dog park, the pet store, or even just meeting another dog on your morning walk. Immunity studies have show that the antibodies given by the vaccine only last 6-8 months so if your dog is exposed to other dogs, he should receive a booster every 6 months. If your dog ventures out of the house only to your backyard, an annual vaccine is perfectly fine. As Benjamin Franklin once said..."An ounce of prevention is worth a pound of cure!" PLEASE NOTE: If your dog has never had (or it has been over a year) a Bordetella inoculation you must allow the new vaccine at least 5 days (prior to arrival) for the vaccine to take effect. If is more than 6 months but less than a year we can administer a booster for $30.00 upon arrival. ü Socialization training - Get a new dog and want to introduce to your current pack? We can help! We require a 7 day notice for all cancellations in part or in whole. 50% of booking will be charged to the credit card on file for any cancellation less than 7 days.